Diving the Back Beaches of the Mornington Peninsula between Point Nepean and Cape Schank near Melbourne is regarded by many as simply the best shore diving in the whole of Victoria. And if you're fortunate enough to be able to access the area by boat, then even more wonderful locations become even easier to reach. 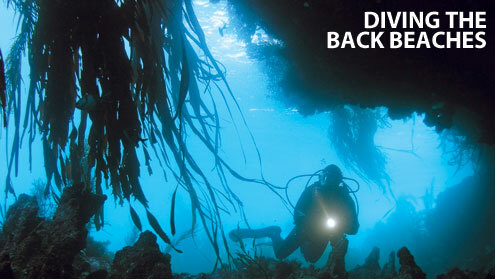 The Back Beach dive sites are exposed to the seas of Bass Strait and the ocean swells which has resulted in a heavily eroded underwater landscape full of caves, tunnels, gullies, swim throughs and canyons crammed with oceanic fish and marine life. You'll find a range of fish hiding within this environment like wrasse, parrot fish, whiting, abalone, rays, wobegongs, port jackon sharks and more! There is also a lot of kelp cover around these areas. A number of ships were driven ashore on the various Mornington Peninsula Back Beaches. The ship wrecks you can dive on include: Australia, Cheviot, Craigburn, Isabella Watson, Light of the Age, Petriana and Sierra Nevada. You'll find details about most of the Back Beach dive sites in a section of our Melbourne Shore Dives web page. Remember the swell, storms, massive waves and fierce rips make the Back Beach dive sites highly dangerous for divers except in rare flat conditions. But as all of the local divers know, when the conditions are right, the diving is magnificent! The Back Beaches are tough dive sites and not for the average diver, with real problems and serious consequences if you get it wrong. Australian Prime Minister Harold Holt disappeared while swimming in wild surf conditions at Cheviot Beach near Portsea, Victoria on 17 December, 1967. His body was never recovered, see Disappearance of Harold Holt. Despite being an experienced skin diver with good knowledge of the beach, the turbulent conditions (high winds, rough seas and rip tides) overcame him. Don't underestimate the problems that lie in wait, or overestimate your own abilities when diving the Back Beaches. Rips: All of the Back Beach dive sites are rip prone. The reefs in the area are very shallow, which means the underwater surge is considerable, even on relatively calm days. Many swimmers and divers have been drowned at Back Beach sites. Be aware of rips in relation to your planned dive route and make sure you surface several times during the dive to make sure you're still on course. Strong Currents: Some of the Back Beach dive sites are still close enough to "The Rip" to be affected by tidal currents. Boat Diving: Large waves can appear without warning, even on calm days. These waves can swamp an anchored boat, so anchoring in this area is not recommended. Plus the deep gutters of the reef can hold fast an anchor making retrieval difficult, if not impossible, in an emergency. The boat should stay live and divers should be dropped and retrieved beyond the break line as quickly as possible. Surf Entry: If you are planning to shore dive the Back Beaches, you need to have excellent surf entry skills. This is not the place to learn them, even on good days. You need to buddy up with some experienced local divers who can pass these skills on to you. The ideal conditions for diving the Back Beaches follow several days of no winds or northerly winds, combined with a low swell. This happens rarely. When the wind is down it's safe to take a boat out through "The Rip" and around to the Back Beaches. The best time to dive the Back Beaches is when the tide is approaching low water. You can look up the tide times for Point Lonsdale on the Bureau of Meteorology web site. If conditions seem too rough, even though the wind and tides look okay, we recommend you choose a different, calmer dive site. If you are not experienced with diving the Back Beaches, make sure you go with an experienced local dive guide or dive buddy who can read the conditions and advise you accordingly. Most of all, stay safe and enjoy your Back Beach diving. Never underestimate an old man who loves scuba diving.